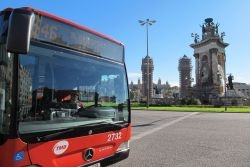 This bus is in operation between 05:30 and 23:50 seven days a week and travels to Barcelona city centre every 20 minutes. You can get this bus from outside terminal T1 where the pick-up point is directly outside the terminal building. 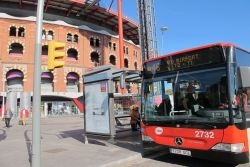 The bus will then travel onwards to T2 (A), (B) and (C) and from there, the bus will head to the centre of Barcelona (Plaça Espanya) in the Sants-Montjuïc district, whilst stopping in a few places along the way. You may use a T-10 ticket on this bus, however it is not possible to purchase these on board unfortunately. On board you would have to buy a single ticket. 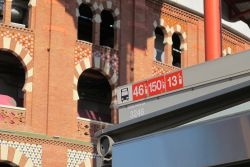 A T-10 ticket (1 zone) allows you to use 10 journeys on any Barcelona public transport service. You can buy them at any metro station. Unless you are a seasoned Barcelona navigator, we would suggest getting off at the Plaça Espanya stop for its onward transport links; most notably the metro network which will allow you to travel all over Barcelona. It is worth noting that the number 46 is a public bus route. Therefore passengers with lots of luggage may struggle for space. If you are travelling with just ‘carry on’ luggage, this service is perfect. When travelling back to the Barcelona airport with this bus, head back to Plaça Espanya and seek out the number 46 bus stop. It is in front of a large, oval building with red detailing. This building is ‘Las Arenas’ formerly a bullfighting ring and today one modern shopping centre. You will also notice the large Catalonia Plaza Hotel to your right. If this is the case, you are in the right place. To double-check simply look at the top of the bus stop which will host a list of bus service numbers which will be stopping there. Of course, the number 46 needs to be one of these numbers. Another dead giveaway will be the people standing around with luggage! 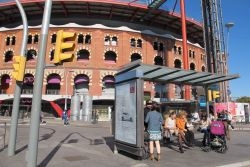 Plaça Espanya is a very busy area for public transport and these points will be important for you to not miss your bus. The number 46 buses are all wheelchair accessible.